The nose starts off with vanilla, sweet malted barley, notes of roasted/toasted bread, bread crust and chocolate. Hints of oak wood and subtle beer derived flavours in the back. Creamy and sweet on the palate with barley sugar, vanilla and roasted bread. Then slightly bitter notes of dark chocolate, even espresso arrive, nicely mixed with a slightly warming spiciness of oak, ginger, subtle cinnamon and white pepper. Roasted elements show up again, intermingling with a touch of yeasty notes and nutty flavours towards the finish. The finish is medium long and slightly warm on coffee, pepper and tender dark chocolate. Significantly fresher on the nose when water is added. The roasted/toasted notes almost completely disappear while the whisky becomes flowery, buttery with vanilla and toffee. Still sweet on the palate with vanilla and malted barley. Slightly warming with oak spice and a hint of pepper. Again, the lovely roasted notes are completely masked by water. The finish is a bit shorter but significantly dry with oak, cocoa and a whiff of espresso. This Porter wood experiment resulted in a nice and delicate single malt. A good balance of sweetness and spiciness with this lovely roasted/toasted elements and dark chocolate flavours from the porter beer. 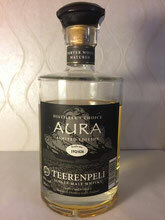 A young but rich whisky with the right influenece of the porter cask - not too much and not too little. I'd like to see more of this kind of experiments in the future. Well done, folks! I thank Henrik Malmberg for the sample and the photograph!